The legendary trumpeter John Gracie has sent me three fabulous photographs today. They are from a performance of the Verdi Requiem, at the Edinburgh International Festival in 1982, by Claudio Abbado and the London Symphony Orchestra. 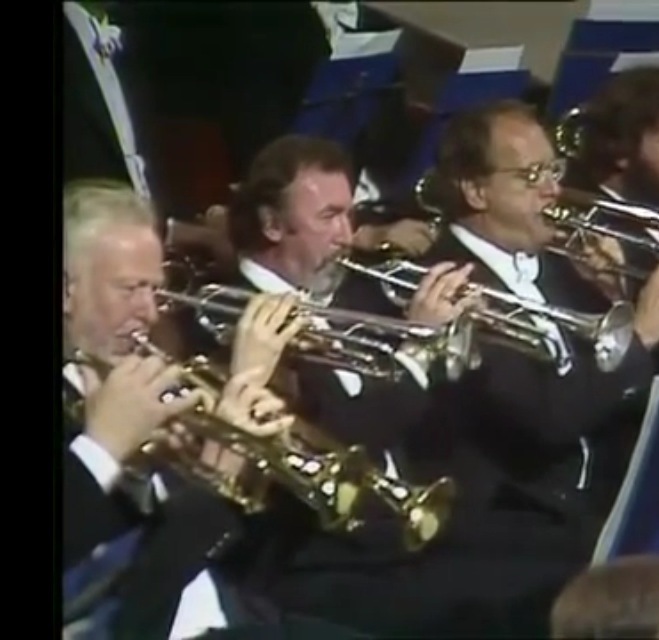 The first is a shot of the orchestra trumpets from a Verdi Requiem in 1982. What a stunning line-up. The soloists are top dollar, on the accompanying video clip. The augmented brass have some of the great British names amongst their number. From the right, on this first photo is Ralph Izen, Colin Moore, Ted Hobart and Paul Cosh. The second shows two of the finest orchestral trumpeters Britain has ever produced. Maurice Murphy (Principal) and the amazing Alan Stringer(who was Principal of my own orchestra – The RLPO, at the time). On the other side of Maurice is the great Denis Wick on first trombone. Any help in identifying all these characters is greatly appreciated… Thanks to all those who have helped to identify the complete brass line-up of this extraordinary performance, several of whom are actually on the pictures and video. Wow! Eleven on-stage trumpets and two off-stage, too. The main on-stage trumpet section is Maurice Murphy, Malcolm Hall, Alan Stringer and Norman Archibald. Behind them, from right to left are Howard Evans, David Munden and Bill Stokes. The four man trumpet section on the other side of the stage are listed in the first photo, but are Ralph Izen, Colin Moore, Ted Hobart and Paul Cosh. 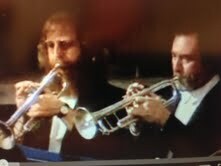 The two off-stage trumpeters were John Gracie and Graham Ashton. 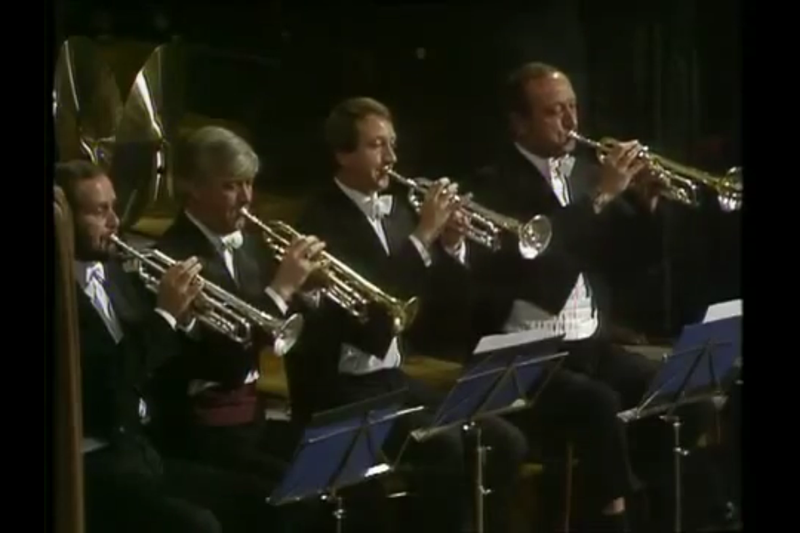 The reason for only two, instead of the usual four is that once the Dies Irae got going the extra on-stage trumpeters joined in to make a much more terrifying racket! The trombone section are Denis Wick, Roger Groves and Frank Mathieson. French horns are Jim Brown, David Cripps, Tony Chidell, Terry Johns and Richard Bissell. I’m not sure who is on tuba, but John Fletcher was the Principal Tuba with the LSO at this time. I’ve just found the live video of the performance on youtube, so you can see for yourselves. 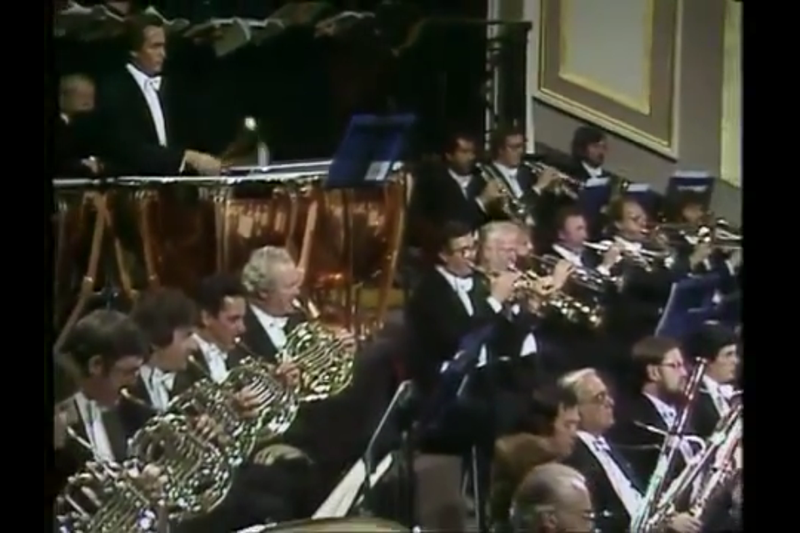 Edinburgh Festival 1982, Claudio Abbado and the London Symphony Orchestra. This entry was posted in The Brass Section, The Trumpet o-iii<O and tagged Alan Stringer, Bill Stokes, Colin Moore, David Cripps, David Munden, Denis Wick, Frank Mathieson, Graham Ashton, Howard Evans, Jim Brown, John Gracie, Malcolm Hall, Maurice Murphy, Norman Archibald, Paul Cosh, Ralph Izen, Richard Bissell, Roger Groves, Ted Hobart, Terry Johns, Tony Chiddell, William Stokes. Bookmark the permalink.